Bellasera is a guard gated community of 360 homeowners and is situated on 290 acres. Approximately 40% of its land is protected wild and unspoiled desert. As a guard gated community, Bellasera provides intimacy and exclusivity to a mere 360 uniquely designed homes. You will find nine (9) different home plans ranging from approximately 1,395 to 3,900 square feet. 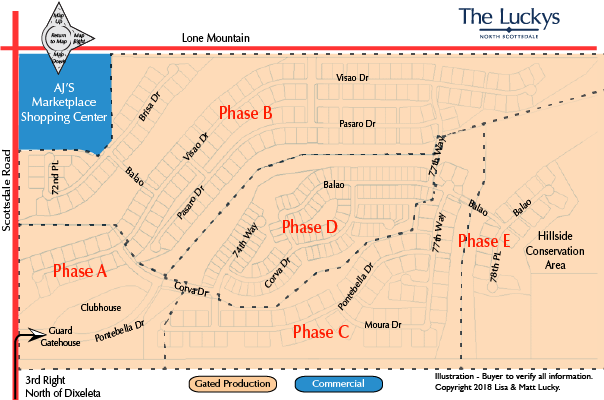 Smaller floor plans are in the middle (Phase D), and larger homes on the south and east side (Phase C & E). This Del Webb community development in North Scottsdale features a 5,000 square foot clubhouse offering a health and fitness center with separate men and women steam rooms. There are also two lighted tennis courts, a dog park, lighted basketball court, a swimming pool, spa, and approximately 8 miles of jogging and walking trails. See all Bellasera - New. See all Bellasera - Sold.